Wielka Danora is a greatgreatgranddaughter of Wielka Este, extraordinary broodmare at Wilkesbacka. Wielka Danora's greatgrandam *Wielka Szampana left only one daughter in Sweden before her export to the US, *Wielka Nuredda by Nureddin. She in turn also had one daughter before her export, Wielka Danata by Danser. Wielka Danata left the stallion Noir by *Aloes and several mares. 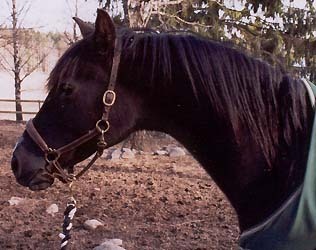 Wielka Zorza produced the mares *Warna by *Naborr, *Wiganda by Faher and *Wielka Kometa by Comet imp Sweden. Wielka Kometa had the stallion *Komis by Czort in Poland. For some reason she was difficult to breed in Sweden and left only one daughter, the in utero import Dokema by Doktryner who left no daughters before her exportation to France. *Wielka Kometa produced one daughter in USa, Cometdora by *Carrador. What is interesting to note is that El Trypoli sired four daughters used in Sweden (beside Wielka Este there was Grobla, *Sake and *Melhafa-Ed-Areg). This is rather large number since he was only used at stud for three years and only had two offspring the last two years.